I love my brother. Well, I mean officially, Mick is my brother-in-law, but I love to call him ‘my bro’. Growing up, I always wanted a younger brother, and even though he is just one month younger than me, I still call him my ‘baby bro’. We were both 19 when we met. He’s my best mate & I love him to bits. It’s because of him that Brendon and I met. I went to uni with some of the guys that Mick spent his primary and high school years with. They are still a tight bunch of mates. So in my 1st year of uni, I befriended these boys. We didn’t get much studying done, but we sure had a helluva social life. And every time, their stories would come around to something crazy that their friend ‘Michael’ had done. And believe me when I tell you, that in each story told, he sounded crazier and crazier. I couldn’t wait to meet him! It was in my first summer of uni that I finally got to meet Mick at a party in Sorrento, and we solidified an instant friendship based on ridiculousness and hilarity. 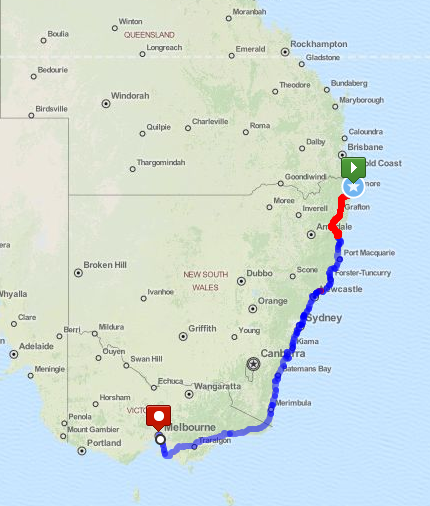 A few months down the track and the frolicking and partying continued at his house in Ringwood. That was when I met Brendon. It sounds cheesy and lame but truly, it was love at first sight. I still remember seeing him for the first time and the instant joy that I felt. It was such an incredible moment, completely consumed with emotion, that I will always remember it. Of course, Brendon’s side of that story is totally different, but we all know that I won him over and, even luckier for me, I scored an official baby brother out of the transaction. I even got a big brother too! Bingo! 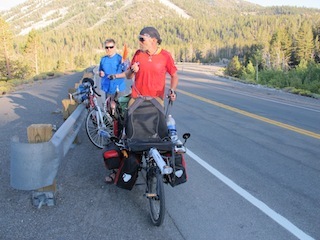 Anyways, I had to tell you all this to explain how very awesome it was to share a part of our TotallyTandem adventure with Mick. His job sees him travelling the globe non-stop, and as a result of his fantastic employment, we have shared adventures in exactly 13 different countries. 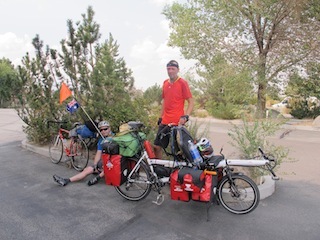 But having him come to meet us in Reno (Reno, ergh) half way through another business trip, hire a bike, send his huge suitcase on to our accom, and pack the bare essentials into a backpack for the road, well, it was a huge effort on his part. It’s easy enough to meet someone in a foreign country, you just need money and a shared goal right? 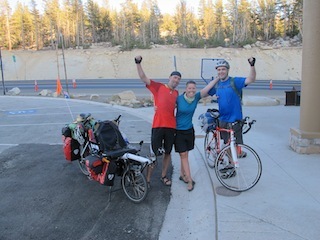 So planning to ride with us for 2 days from Reno to South Lake Tahoe was a new adventure for all of us. We had never ridden with any of our mates or family before, and Mick had not done much long distance riding at all. We like camping, he likes fancy hotels (he IS very fancy). We wanna ride everywhere, he likes to hire a car. So some negotiations had to be made by all of us, and what an incredible time we shared together. So you see, I couldn’t just start writing about the journey on this one. I had to fill you in all these details so that you can understand the monumental, and quite historical, happenings that happened. I should also mention, that when you do something fantastic with Mick, things don’t always go according to plan. This is of course, one of the reasons we all love him so! Mick arrived in Reno on the 3rd September and knocked on the door of our hotel room around 8pm at the lack lustre ‘Harrahs Casino’. 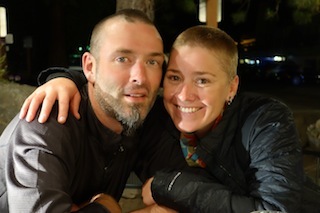 It’s always so excellent to see his face, even though it had only been 9 months since our last meeting in Japan. He had flown from Manchester and was very jet lagged. 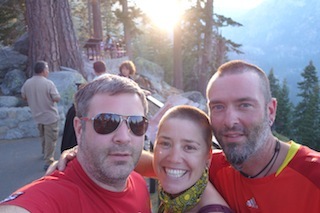 We had left Burning Man the day before and had already spent one night in Reno ‘decompressing’. We were all pretty shattered. Sharing a huge room with 2 queen sized beds, we sat and ate pizza, had a few beers, shared a bit of news, then all keeled over from exhaustion. The alarm went off at 7am and the mission was on; pack up all of our stuff & prepare ready to ride 55km to the halfway point at Incline Village. 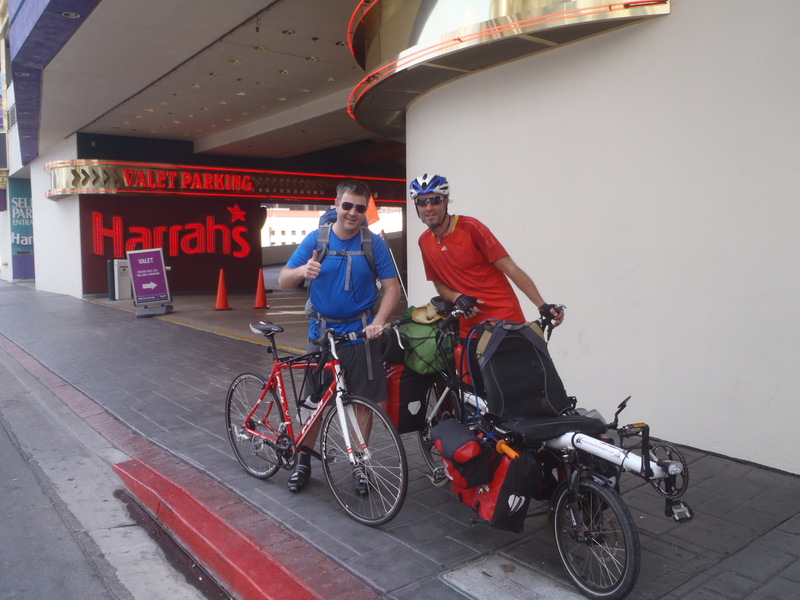 Ideally, we would have liked to hit the road early and get some kms under our belts before lunch time and the heat of the day, alas, the only place in Reno that would rent a bike opened at 10am. But it’s only a 55km day so we should make it to our hotel in Incline Village before dark, even if we leave around midday. 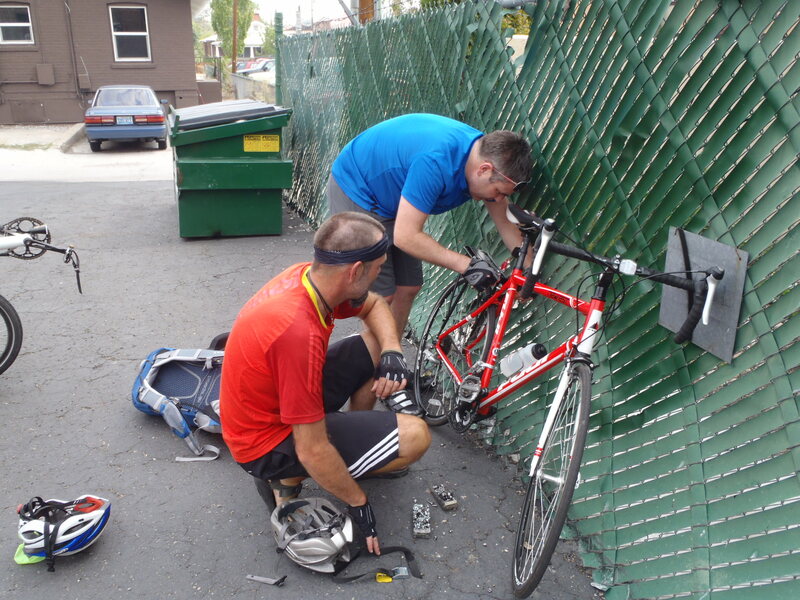 We readied what we could, had breaky and then Bren & Mick went to suss out this hire bike. Now I could spend some time here explaining the dodgey-ness and laziness of the ‘company’ that hired Mick the bike, but I think you get the gist already. They made arrangements for his hire bike to be ready to collect in an hour, so we got Falkor from the Bell Boys, and loaded him up. When Mick returned with his hire bike, he had the pack rack in his hand with a useless bungey chord attached. “We need to find a way to attach the rack,” he said dead-pan “the guys at the shop thought this would work”. 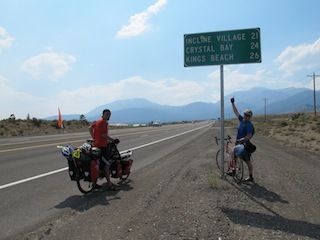 The ride from Reno to South Lake Tahoe is 107km. One lowsy little bungey chord is not gonna hold the rack on for 5km, let alone a loaded rack. So sorting out his luggage best we could, we set off on our first ride together, Mick with pack-rack in hand, to a bike store that may actually be able to help us. 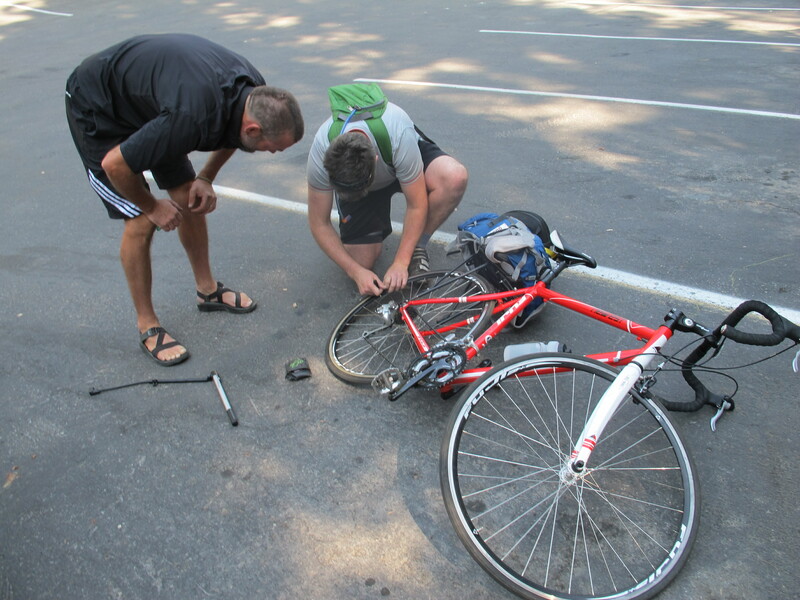 Another hour later, and a new inner tube for Mick, and we have the rack sorted and are finally ready to set off. It’s now midday. 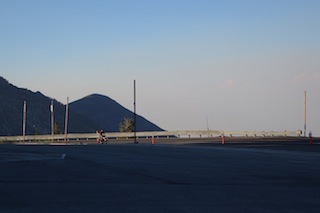 We ride 10kms along the hot Reno highways to turn off at the Mount Rose Highway. It’s 33 degrees and absolutely sweltering. Either side of the highway is desert, and it’s a constant incline into a head-wind. A hard start. We stop at a service station with some shade and reassess water and hat options. Brendon and I have drunk 2 litres of water already, and we are usually pretty frugal with our consumption. We stop in another 5km to have lunch in a ski-shop drive way, and I re-fill our bottle. Once we take off from there the road starts to wind into a forest with some interesting sights, but most of all, lovely shade. It’s now about 2pm and we have 40km or so, still to go. Should be a breeze. Then the climbing starts. 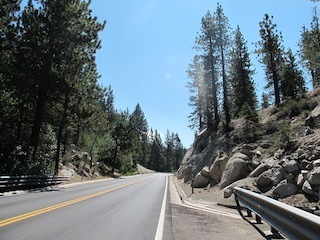 There are really only 2 routes from Reno to Tahoe, and we debated on whether this course would be too tough as it reaches an altitude of 8900ft/2712m. 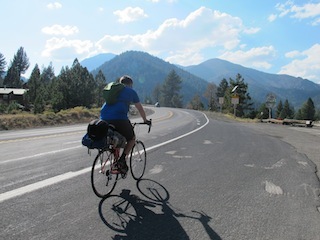 The other route was through Carson City, which also climbs quite high up to 7400ft/2255m. 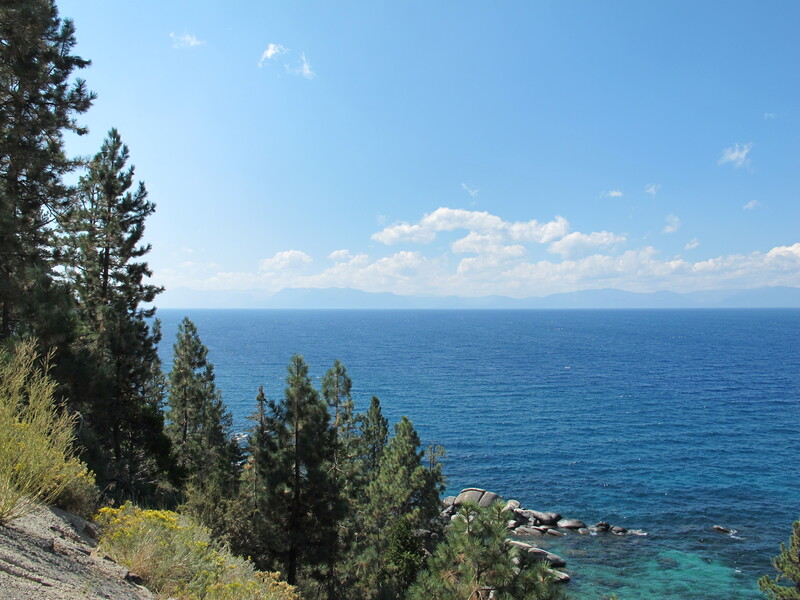 So, we chose the more difficult route as we thought it would be prettier to ride into Incline Village with views of Lake Tahoe. The highest I have even been is 12,388ft/3776m on top of Mount Fuji. People do experience altitude problems at this height, but we had no worries at that time. 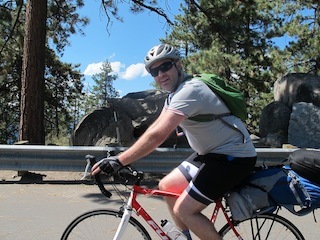 Also, hiking is nowhere near as strenuous as cycling & carrying 50kg of weight on a bicycle built for two. 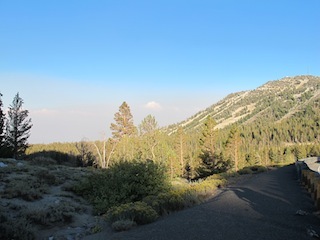 Around 8000ft/2338m was when we started noticing its effects on us. It starts with heavy breathing, then some shallow panting, feelings of nausea and weakness. 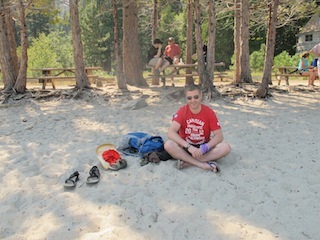 You have to stop every 200 vertical metres or so for a break. It was really hard and really slow going. But we were all together, encouraging each other, sharing bits of magic from our packs (hydration tablets, lollies & lip balm) and enjoying the gorgeous scenery. Still 30km to go and now it’s 4pm. Hmmm. Well, the sun has backed off, so that’s a good thing. But with all those tall trees and surrounding mountains we realized that we only had another 2 hours of daylight left. That’s when Mick got his second wind and we started to fail. 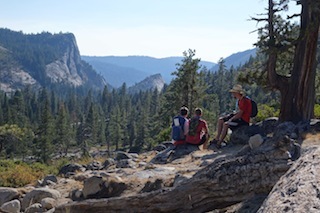 The last rest stop before the final push to the top. 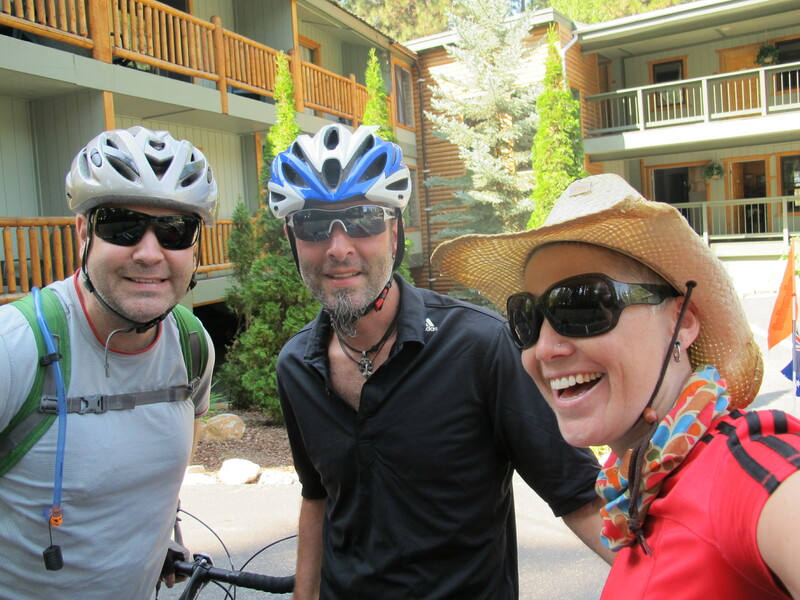 It had been 2 weeks since we had been on the bike and we felt out of shape and out of sync. This was such a hard day to ‘get back into it’ and we were all struggling. There were 2 false summits, but apart from that, a steady incline at an average of 7% for 30km. 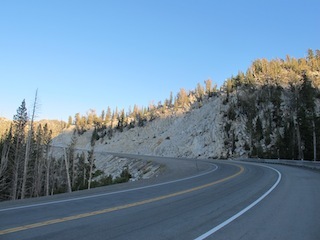 So when we came around the corner that we thought was the highest pass, only to find it was another switch-back with another steep climb, I lost it. I was whimpering with every pedal push. Brendon was hallucinating. I had my eyes closed and was trying to quiet the demons in my head with the mantra “strong legs strong legs”. We ran out of water and pulled over one last time and just sat on the side of the road on the very narrow shoulder. We couldn’t even speak. We just had to get there and somehow, we had to do it fast. 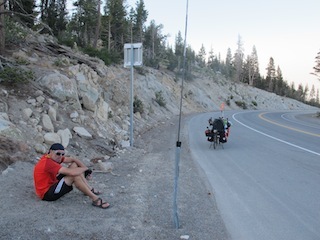 The temperature had dropped to 13degrees, 20degrees cooler than when we set out. Brendon and I drank nearly 5 liters of water each that day. Can you see Mick on the road up there? He is on his last push to the top. Go Mick! IT really is just around the corner this time! Jumping back onto Falkor, we just turned our legs over and begged to see the top. 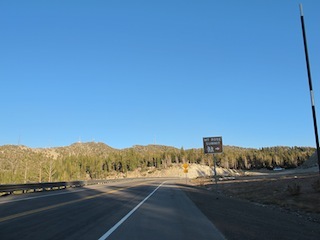 Finally, we saw the sign signifying the pass. I started crying with the emotional exertion of it all. Mick had beaten us to the top by a few mintues, but even he was unable to operate his camera properly to capture the moment. We made the summit around 6:50pm, after riding for nearly 7 hours. We met a random guy up there who took some snap shots for us, but we couldn’t take long. It was getting colder and darker, and we still had around 23km to reach Incline Village. Finally! Confirmation that we really were at the top this time! It was however, all down hill. A very steep and fast down hill. We smashed those 23km in under 20minutes and were in our hotel room by 7.30pm, all showered and out the door for dinner by 8pm. The views of the Lake were stunning in the sunset, but we were going too fast to stop and take photos. Those ones are for the memory only. And we had to stop 3 times on the way down as we were going too fast and Bren’s contact lenses were threatening to blow off his eye-balls. It was by far, the hardest and most challenging days riding we have done. And brother Michael had his TotallyTandem baptism of fire. A really long, slow burning baptism. Over dinner and beers we all located our sense of humor again, and celebrated this unbelievable feat of 3 regular human beings with overwhelming appetites for challenge. After a few beers, the really awful & hard parts started to fade away. It’s amazing how that happens when your sense of achievement kicks in. Thursday morning arrived swiftly and we set off on our 2nd and final day riding together. 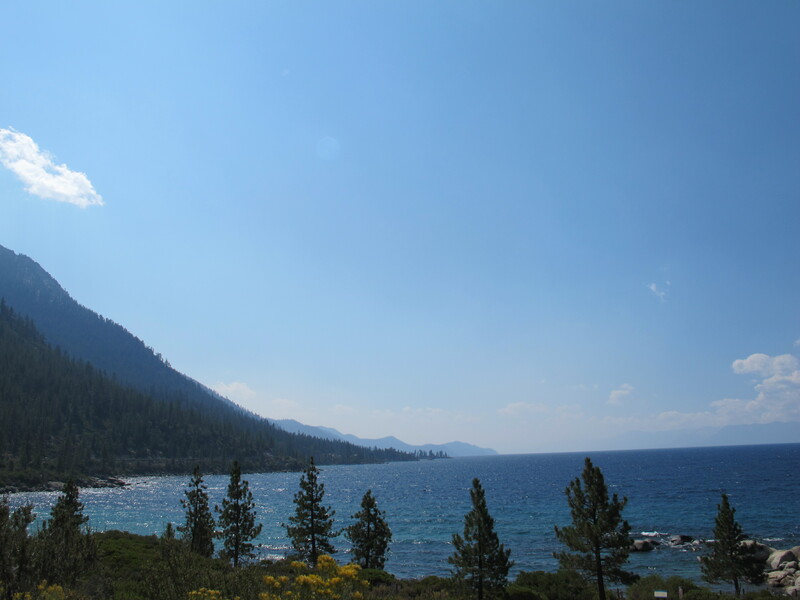 Destination; South Lake Tahoe. 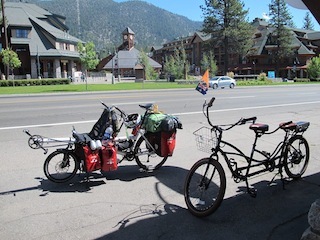 Another hot but gorgeous morning, we enjoyed a little sleep-in and, after quickly pumping up the tires, set off around 11am to enjoy stunning views in yet another killer head-wind. But with every incline we rode, we laughed “it’s not as bad as yesterday”. 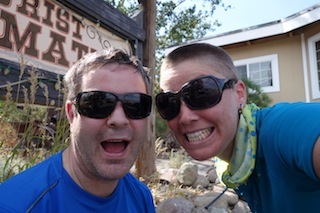 We stopped regularly and took lots of pics. 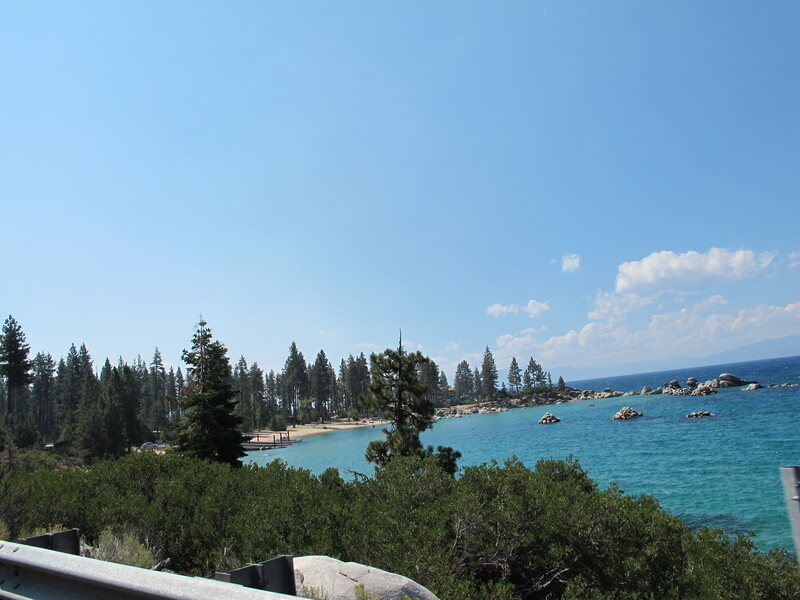 Having climbed the steepest pass of the day, we took the turn off to Tahoe & had an excellent long down hill with incredible views of the sapphire blue lake. It was around 5km of fast downhill. Mick caught up with us at the bottom as we started climbing again, and was choking on his words as he tried to explain his fright at us passing him at 70kmph. We go pretty fast downhill, its true. We settled into a good climbing pace again for a few kms then I heard Mick exclaim “Oh no” (or perhaps those weren’t his exact words, but words to that effect). 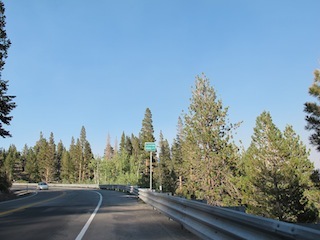 The shoulder was particularly narrow and we were on a busy part of the Highway 50 so we called back that we would meet him at the next turn out. He was walking his bike so we assumed he had a flat tyre. Oh dear. Nope, the whole tire had blown out and a huge egg had pushed through the exterior rubber so that his wheel would not even spin. 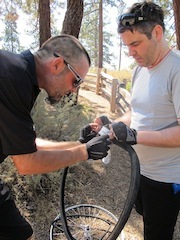 After some choice phrases were exchanged about the quality of the rental bike, the boys set about removing the wheel and trying to patch it. “Duct tape should work” Bren announces. After about 30 minutes of duct-tape management, they blow the tire up again only to discover, the egg is stronger than the duct. And even I know what that means. “It’s only another 10km into town” Mick says, “I’ll just deflate it a bit so it spins and hopefully it should be right”. Now I rarely pipe-up in these situations, as I love to watch blind optimism unfold into great things, but I saw a major safety concern and put my foot down. My concern for safety was obviously shared as there were no arguments and a swift thumb was stuck out. It wasn’t too long until a nice man pulled over and re-shuffled his belongings for Mick’s bike to fit into his wagon. When I say it wasn’t too long, that refers to my reign as chief thumb waggler. 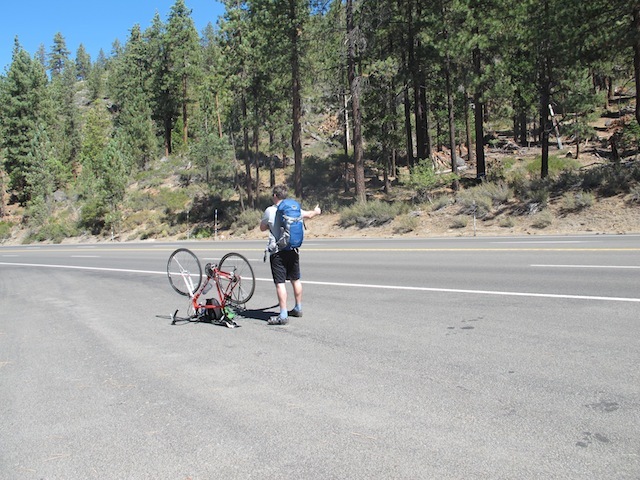 Seeing that Mick was having no luck flagging down a ride, I cast the boys to the edge of the road, turned the bike upside down to highlight my distress, donned a helmet and did my whole damsel thing. It took about 5 mins until this bloke pulled over. This was the point when we named Mick’s bike “The Reno Reject”. 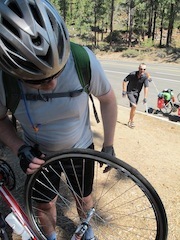 “Meet you at the bike shop in Tahoe” was our plan. It seemed solid at the time. Turns out, it was pretty flimsy. “Ah, it’ll be fine. Keep pedaling”. 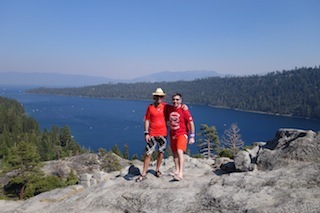 So Bren and I rode solo the final 10km to South Lake Tahoe town. It took about 45minutes. We stopped at the 1st bike shop. Nope. 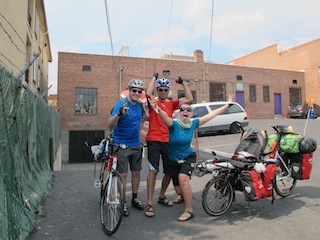 2nd place we stopped had an electric tandem out the front of the store, and the owner came bounding out to greet us and ask us about Falkor. “We’ve lost our brother” I tell him, along with the eggy wheel scenario. “Oh, he will be at the bike shop just up the road there.” So off we set again to try and find brother. We feel good. The town is lively and sunny, and there are lots of nice cafes and bars. We are pretty hungry and start imagining that we find Mick on the patio of some such lovely establishment with a jug of beer.  I walk into the next bike shop. Well the good news is, he didn’t get abducted and we are hot on his tail. Win. At this point I should tell you, we have no mobile phone, but Mick does. We decide to ride a few kms further down the road and see if he is waiting for us there. Nope. Hmm. We don’t know exactly how far it is to the chalet, but think he must’ve decided to head there. So we consult Goober, and plan to do the same. Goober? Goober? Total Goober fritz out. Not good. I should also point out here that we have only eaten muesli bars since breakfast, 6 hours ago, and are now on a direct course to ‘hangry town’. (hungry + angry = ‘hangry’). Luckily Bren had studied a google map several days before. He can’t remember how far it is, but he is pretty certain of the route. It was all a bit confusing and exhausting after that so we didn’t take any more photos. Instead, I thought I would add this lovely pic of the lake. 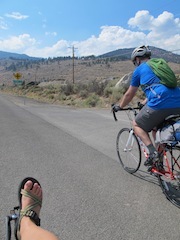 It’s a further 15km, into the same bloody head-wind, through the hot streets of Lake Tahoe and lots of dusty road-works. And too many steep pitches. We finally find the chalet, get inside and skype Mick. “I’ve been riding up and down the highway looking for you”, he says. “I’ve decided to head to the chalet and will be there in 10 minutes.” I think the moral here is that when you are waiting to find someone, stand still. Well, we located him at least, we found the chalet and even though we didn’t get to ride the last few kms to the chalet together, we are stoked with what we have achieved. A flock of Cary’s riding together. Bloody awesome stuff. After a quick BEERRUN & some meats for a BBQ dinner, we all slip into the hot tub to celebrate a huge 2 days riding and the next few days ‘chilling’ out in the poshest chalet ever. 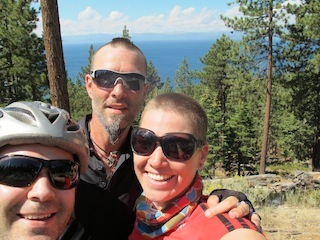 The next 5 days spent ‘chilling’ in Tahoe means; we are joined by some awesome friends (Sam & Carly) who bring the party with them wherever they go, we do a day-trip to Emerald Lake, hike the HorseTail waterfall and mountain bike the amazing Flume Trail (stand-by for that video). It is evident that we need a holiday from this ‘break’ before we get back on the bike! From Tahoe we rode 2 days to Sacramento, then Vacaville, American Canyon, Marin and then start to head back to San Fran and will fill you in on those deets in the next blog. Brilliant post. Great read to start the day here in Shibuya. Soooo jealous! Good luck to you both – we’re all cheering you on here at BST. Thanks for keeping an eye on us Brian! Great to know you are following along! Hope that term 1 is off to a flying start! That’s a very cool adventure to (definitely) write home about! I could totally picture hangry Bremma, particularly Bren. Hahaha. God you guys are amazing!!! Where do you get the inspiration to dig so deep??? Guess your cause makes all the struggle worth while. We are all rooting for you here in Japan!! So wonderful to hear from you & we are delighted that you are following the blog. 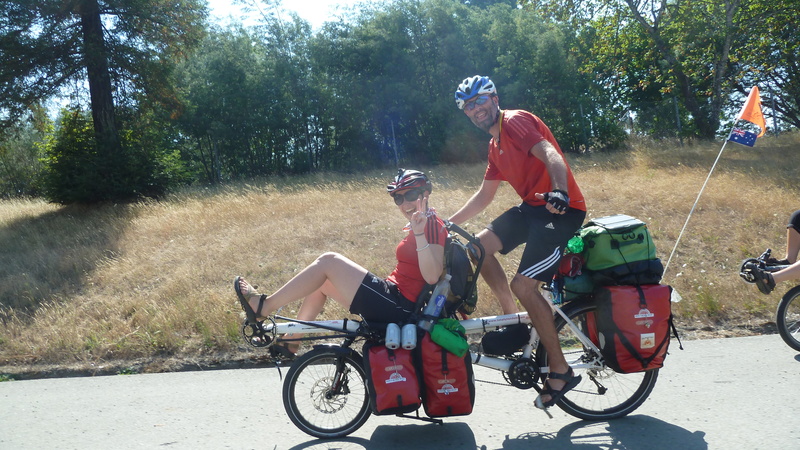 Sending pedal powered loving to you all! Hope term 1 is treating you all well! Emma, you should have done the same, come on ! Ha! And we see you have cut yours off! Shame on you BG! That was a birthday present!